Industry Experts, Inc. published a new 2018 version of its global market report on Synthetic Vitamin E. The new version of the report entitled “Synthetic Vitamin E – A Global Market Overview” reveals that Animal feed is the largest application area with a volume share of about 83%, translating into 87 thousand metric tons, and a value share of 65.2% equating to US$843 million in 2017. Synthetic vitamin E constitutes the major ingredient employed in the global animal feed sector, with the market for this key additive continuing to expand in direct proportion to demand for livestock that is more evident in the developing economies of Asia, Africa and Latin America. Brazil, China and other Asian and African regions. Vitamin E plant closures, such as those of BASF in Germany and others in China, have tightened the supply of vitamin E since the last quarter of 2017. As a consequence of this, the supply of vitamin E will constrict in the first half of 2018 and cause considerable price hikes. Being a major consumer of vitamin E will adversely affect the animal feed industry, since spikes in prices are likely to increase costs of livestock feed supplements. Already, feed manufacturers and formulators are seeking out alternative ways, such as reducing vitamin E levels in feed or replacing with other ingredients, to alleviate the situation. Industry experts suggesting a challenging outlook for the global vitamin E market till at least the second half of 2018, which would gradually ease off after that. Synthetic vitamin E end-use applications covered in this report include animal feed, dietary supplements, food & beverages and cosmetics. Global consumption of synthetic vitamin E, in terms of volume stood at 104.6 thousand metric tons valued at US$1.3 billion in 2017, is further expected to maintain a volume CAGR of 1.8% between 2017 and 2024 to reach a projected 119 thousand metric tons in 2024. 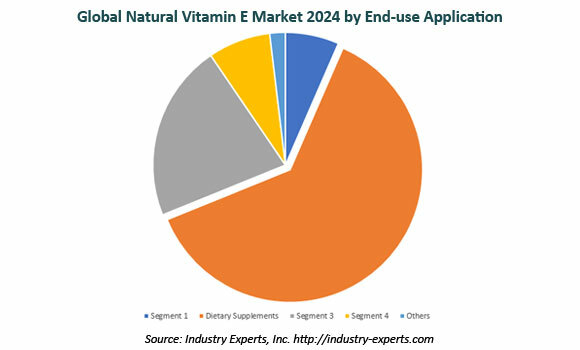 The report reviews, analyses and projects the synthetic vitamin E market for global and the regional markets including North America, Europe, Asia-Pacific, South America and Rest of World for the period from 2014 to 2024, in terms of volume in metric tons and value in USD. The regional markets further analyzed for 14 independent countries across North America – The United States, Canada and Mexico; Europe – Germany, France, Italy, Spain, The United Kingdom and The Netherlands; Asia-Pacific – China, India and Japan; and South America – Brazil and Argentina. This 188 page global market study on synthetic vitamin E includes 140 charts (includes a data table and graphical representation for each chart), supported with meaningful and easy to understand graphical presentation, of market numbers. 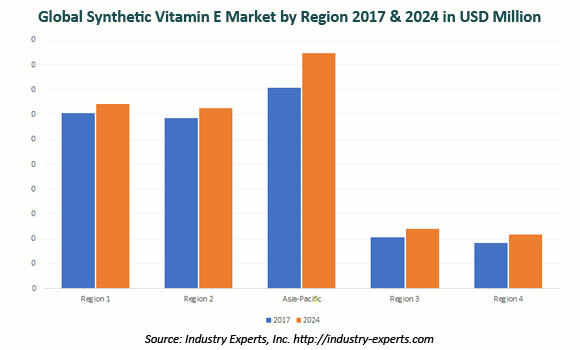 The statistical tables represent the data for the global synthetic vitamin E market value in metric tons and value in US$ by geographic region and end-use application. This study profiles 7 key global players and 14 major players across Europe – 3; Asia-Pacific – 10 and Rest of World – 1. The report also provides the listing of the companies engaged in the manufacturing and supply of synthetic vitamin E as well as major players in vitamin E end-use industries such as human nutrition, animal nutrition and personal care. The global list of companies covers addresses, contact numbers and the website addresses of 109 companies. Industry Experts, Inc. published a global market report on Superabsorbent polymers (SAPs). The new report entitled ” Superabsorbent Polymers – A Global Market Overview” reveals that the Asia–Pacific accounts for the largest share in terms of both consumption and market value. The market for this region is estimated at US$2.5 billion in 2017, translating to 772 thousand tons. The region is also expected the fastest growing market with 6.4% and 6.1% respectively for value and volume between the period 2017 and 2022. Superabsorbent polymers (SAPs) or hydrogels constitute loosely cross-linked, three-dimensional networks of flexible polymer chains containing dissociated, ionic functional groups. Principally, they are materials capable of absorbing fluids more than 15 times their own dry weight, either under load or without load, such as water, electrolyte solution, synthetic urine, brines, and biological fluids, such as urine sweat and blood. Growing population across the world, be it children or adults, has increased the demand for personal hygiene products, such as baby diapers and feminine hygiene and adult incontinence solutions. These factors, too, will play a contributory role in sustaining demand growth for SAPs. Sodium Polyacrylate forms the largest segment in the global market accounting for an estimated US$5.8 billion. Among SAPs key applications, Baby Diapers constitute the largest application estimated share of 75% in the same year. The report analyzes the market for SAPs polymer types including Polyacrylamide Copolymer, Sodium Polyacrylate and Others. The study also explores the global market for key applications of SAPs comprising Adult Incontinence Products, Agriculture & Horticulture, Baby Diapers, Feminine Hygiene Products and Others for the analysis period 2014-2022 in the global markets comprising North America, Europe, Asia-Pacific, South America and Rest of World. 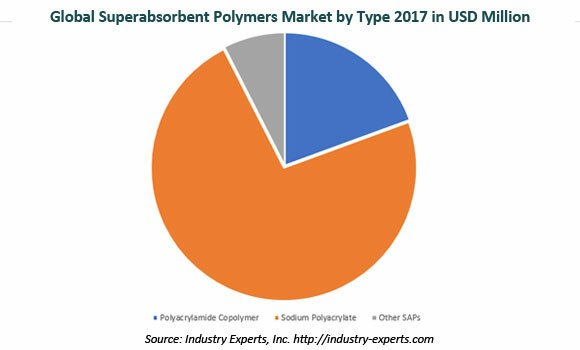 The market for Superabsorbent Polymers is segmented into five major global regions namely, North America, Europe, Asia-Pacific, South America and Rest of World. The regional markets further analyzed for 11 independent countries across North America – the United States, Canada and Mexico; Europe – France, Germany, Italy, Russia, Spain and the United Kingdom; Asia-Pacific – Australia, China, India, Japan and South Korea; South America – Argentina and Brazil. The market is analyzed in all of these major regions by key county, polymer type and application area in terms of volumes in Tons and value in USD. This 484 page global Superabsorbent Polymers market report includes 407 charts (includes a data table and graphical representation for each chart), supported with meaningful and easy to understand graphical presentation, of market numbers. The report profiles 17 key global players and 35 major players across North America – 1; Europe – 4; and Asia-Pacific – 30. The study also provides the listing of the companies operating in the SAPs industry. The global list of companies covers the address, contact numbers and the website addresses of 116 companies.